Going out in a blizzard is rarely a smart move, and when you try it in Raius' new adventure game Millika Village, you end up in a crumpled heap at the bottom of a steep slope. 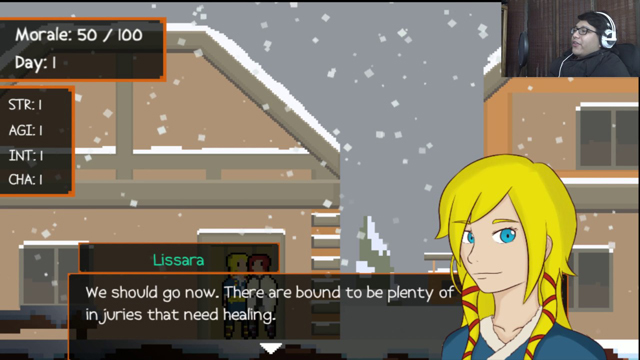 Fortunately your motionless body is spotted by Kira, a hunter from nearby Millika Village, who picks you up and brings you to village healer Lissara to be nursed back to health. Upon your recovery, the village chieftain puts you to work in exchange for food and shelter. You spend the next twenty days helping the villagers prepare for a freak storm that has the potential to tear the village apart, and your decisions will directly impact your chances of survival. Once you pass the initial narration, use WASD to move your character around the village and press [E] to interact with items and people. Each day, you can choose one of four different tasks to complete, which will impact your strength, agility, intelligence, charisma and morale. As the game progresses you will be presented with a number of choices, the results of which will have a direct impact on your skills and whether the village survives the storm on the last day. Millika Village is presented in simple fashion with 8-bit style graphics, but it is an engaging story and if your first attempt ends in total disaster (as mine did) you'll probably find yourself restarting the game for a second (or third) attempt.